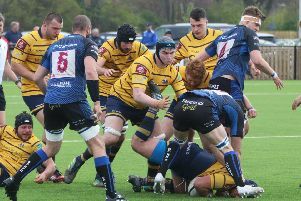 Worthing Raiders were well beaten as they kicked off the new National 2 South season at much-fancied Taunton yesterday. A debut try from George Brown gave Raiders some early confidence but Taunton showed their quality, running in ten tries on the way to a resounding 62-24 victory in the opening day battle. Experienced Matt Walsh (two) and another debutant, Curtis Barnes, got the other tries to ensure Worthing came away with a losing bonus point after a late rally. It looked to be a challenging way to start the season for Raiders and it proved to be just that. Taunton are expected to be title contenders over the upcoming campaign and finished fourth last season. Raiders head coach Jody Levett did have a positive to come away with as his side collected a losing bonus point. He said: “It was a really tough start to the season away at title contenders Taunton, so picking up a point on the road is important. “There is lots to work on as you would expect this time in the process of 30 games. "We had three debutants experiencing this level for the first time, who did well and an important journey in their development and gaining much-needed experience. Nick Mason was the star of the show, getting four of Taunton’s ten tries. Jarrard Hallard’s early converted try was cancelled out by debutant Brown going over for Raiders to leave the scores finely poised at 7-5 inside the opening ten minutes. A barrage of tries would come for the home side before the break, with Mason (two), Oscar Kolowski and Sam Brown helping Taunton open up a 31-5 half time lead. Ollie Rice went over then Mason completed his hat-trick soon after the restart to put the game beyond Raiders. Mason had another soon after before Worthing pulled one back through Walsh. There was still time for Kolowski to grab a second try of the game and Isaac Dalton to get in on the act as Taunton led 62-10. Raiders stuck to their task, with Walsh scoring again before debutant Barnes went over in stoppage time - securing a losing bonus point for the visitors. Worthing will be looking for a first win of the season at new boys Guernsey, who were on the end of a 59-5 opening-day defeat at Old Albanian - on Saturday.